Starting in my art journal can be the hardest part for me. Why? Because that is when I tend to over think and trap myself in my head. When I am in my head, I get stuck. How do I get unstuck when art journaling? Challenges. There are rules, guidelines, and most importantly for me, a place to start. 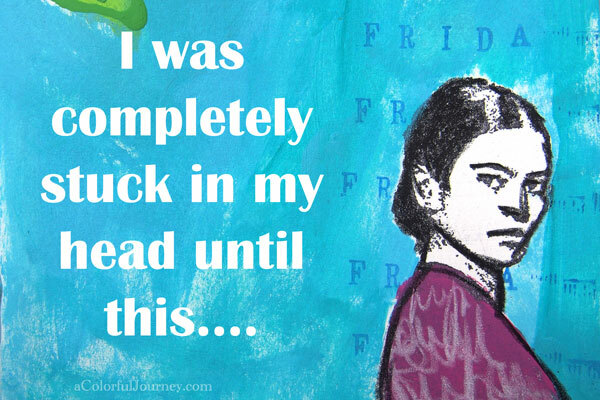 This month Art Journal Journey has a Frida challenge. By joining this challenge, the rules gave me a place to start. It had to be related to Frida. 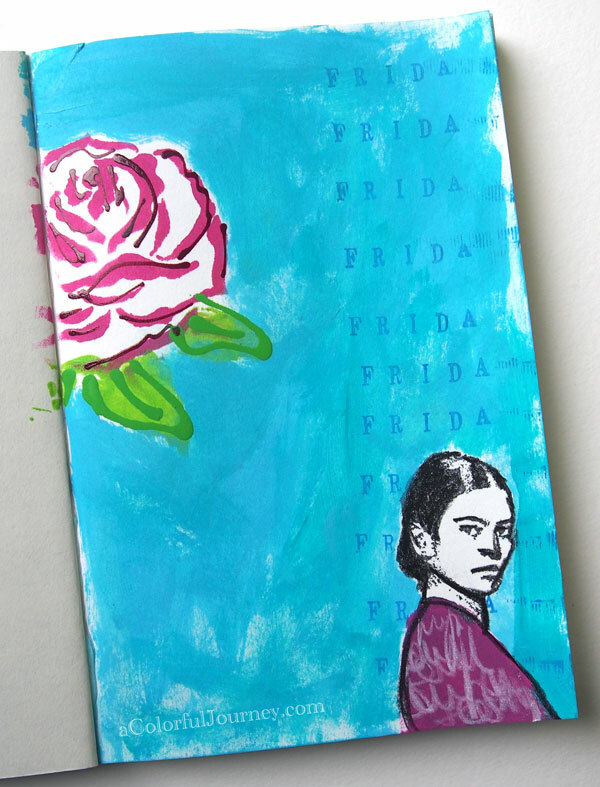 Watch Playing with Frida in my Art Journal on YouTube. Sharing with my friends at Art Journal Journey. There are lots of great art journals shared over there – take a peek! Sharing with Inspire Me Monday, Creative Every Day Paint Party Friday, and Art Journal Every Day. beautiful page and such a fab video Carolyn! Oops help me out every time Ruth! Love the oops and the simplicity of this technique – WAY fun! Thanks. They are quite handy Mary….I’ve had mine for years and still love it! I love how you changed up Freda! Good idea to draw/write over a stamped image! Well, I’ve crossed over to the fun side! Have gradually been adding inks, stamps, cricut explore, stencils (cutting my own assortment), gelli plate, even some Manila tags! Been claiming it for use with my encaustics. HOWEVER, reorganizing my studio I came across a journal I made ten years ago for a critique group I was in where we swapped our books and did something arty in each other’s books. Made it with handmade paper with glassine interleaves. I may get it out where I can see it…and add some pages. Just for technique exploration, of course, for someday use in my ‘real’ art. Buahahaha! Welcome to the fun side Vicki! Hope you’ll share what you do in your journal! I’ve just gotten back into my crafting and came across your youtube videos. I am enjoying the beautiful pages, but more I love hearing about battling the inner critic. (Mine can be very loud at times). It’s a lovely page with the soft blues. Very nice! Great works. Enjoyed the video, thank you. 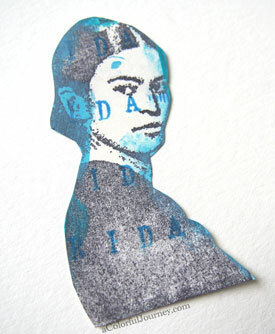 such a pensive look on Frida-I have a Frida stamp from Invoke arts too-a different one:) I’m not used to seeing such subdued work and color from you Carolyn-but I love this just as much! Beautiful Carolyn, you are not alone…all of us get stuck at times! Love your journal page!!! Frida has always been a great inspiration. Wow a great tribute to Frida. I really enjoy your video too. Sorry to hear about the computer problems…. that stinks! But I loved the narrative intro and ending, as well as the fun journal page.